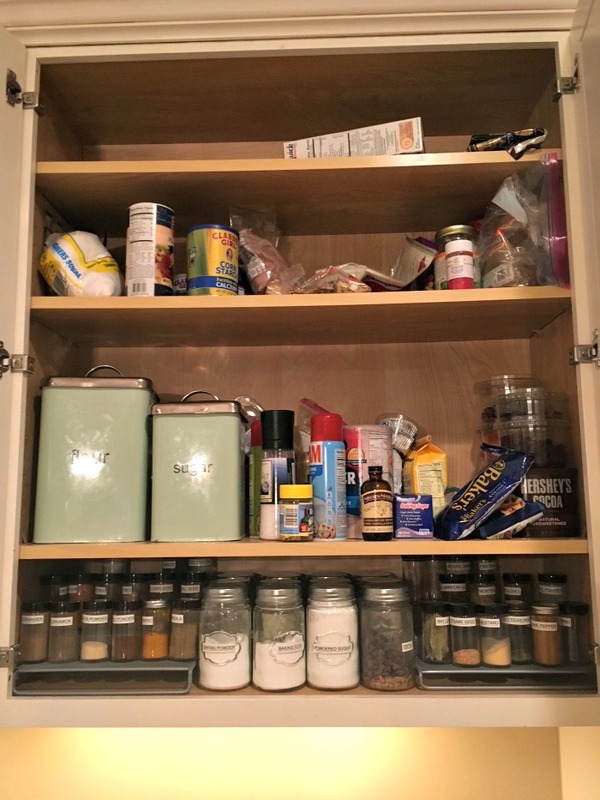 Baking & spice organization - A Life From Scratch. Finally getting around to writing about this baking & spice organization project for the blog, yippee! 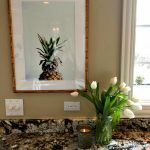 One of my most well liked and commented posts on Instagram, I hope to answer all your questions and perhaps inspire you to begin to work on your own cabinet! This cabinet was an area of my home that just made me feel so unhappy. And yet you get used to that feeling, right? I practically rolled my eyes every time I had to open it (a lot daily) and yet I never did anything about it. It’s amazing the sort of level of acceptance we can tolerate in our own homes. I knew this cabinet could look beautiful and more importantly, be functional, but I just didn’t want to dive in and fix it. It felt overwhelming. To make things clear, here is my before. Yep. Just throwing that terrifying image out there. Please never think my home is perfect because it most definitely is not. And the ‘perfect’ spots that I have created I have had to put the time and effort into making them so. None of this is effortless, although beautiful homes and spaces can certainly feel that way once you get there. So to begin like any project similar to this I took everything out and wiped down all the shelves. You need a clean blank space to work with and it really helps with narrowing down what you actually want to put back in. 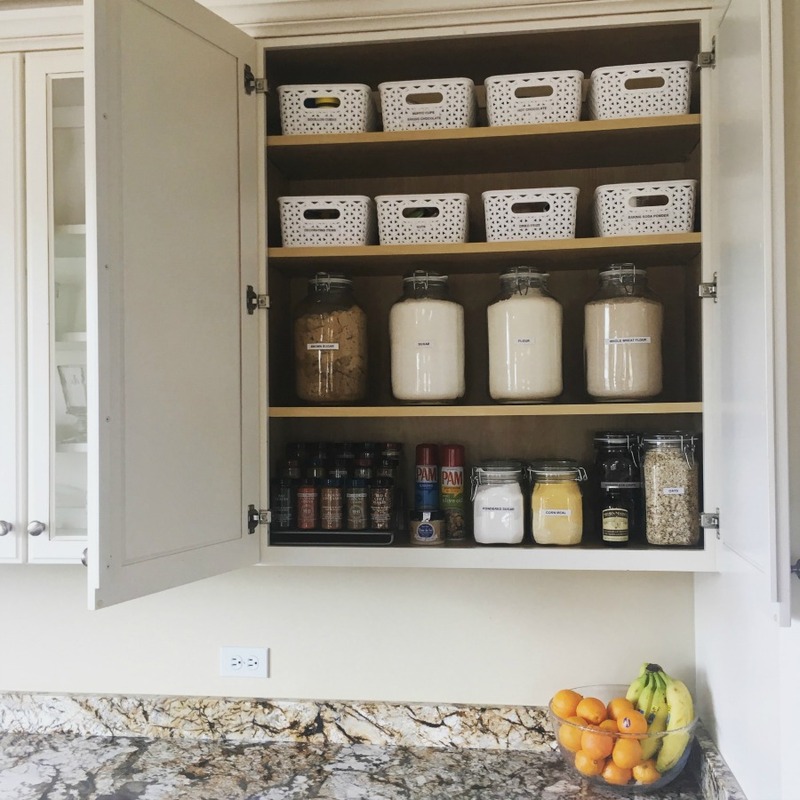 For me, I wanted this space to solve my spice problem and to clearly store baking items I use on a weekly basis. Also by taking everything out, you can see what you really use and need to make space for. Dried fruits (I had three half containers of cranberries what the heck), nuts (two things of chopped pecans), baking chocolate, baking soda, half containers of oats, etc. At this point I made a list of what our home needs and uses. This part feels so unique to each home. Think about what spices you love and reach for constantly, what types of flours you bake with, do you have endless amounts of sprinkles and decorating tools 0r just a few simple items? Answer these questions for yourself and go from there. Also during this process purge what you don’t use! I was clinging to some cookie cutters that I hadn’t touched in ten years. I am a mom that does not make homemade cut out sugar cookies. I am ok with that. Goodbye. Also I felt I randomly needed to own gluten free flour because, I don’t know aren’t we supposed to be using that? Yet it did not work for me or for my home so goodbye. Throw things out that you don’t use religiously then assess what you love and need to stock. 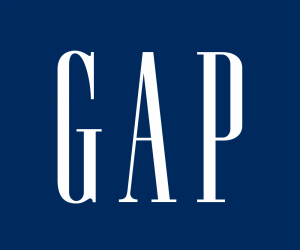 From there I came up with a design plan. I knew I wanted large containers of brown sugar, white sugar, flour, and whole wheat flour because I reach for these time and time again. I found mine at Target and they were a great price. Be sure to find ones that really seal otherwise your ingredients won’t stay fresh. Onto the spices. Ah, the spices. I feel like it’s such a struggle am I right? I had three jars of 1/2 used cumin and spices that I’m pretty sure expired five years back. Two things of red pepper flakes. Yet it’s all because my system was terrible. I couldn’t see what I had! I knew I wanted to easily display the ones I reach for time and time again. I also had slowly been transitioning to all one brand, a key to keeping spices organized I believe. I went with Morton & Bassett spices because my favorite store carries them and honestly, I liked the jar and size. I had to fill in some holes and fill up bottles with other brands until I’m truly transitioned (didn’t want to waste much) but I am loving, loving, the new system. My spice rack is from Bed Bath & Beyond and it holds fifteen spices, which I have in alphabet order. I have a drawer below that I’m still using with overflow and spices that are still fresh but not the same brand. I contemplated doing two spice racks in the cabinet but felt keeping it streamlined to what I cook with the most would be best. The smaller glass jars on the bottom shelf hold powdered sugar (always a MESS with that bag! ), corn meal, bisquick, and bread crumbs. The two taller ones store oats and chocolate chips. Up top are the white baskets, which I found at Target for the lovely price of $2.99. I was asked quite a bit what I stored in these and I just built my list off of what I use the most. I have a basket for decorating items (sprinkles, and such), nuts, dried fruits, baking soda and baking powder, bouillon cubes (which yes, I actually use! ), muffin cups and baking chocolate, and then I have a whole basket for a little hot chocolate kit. One basket is still empty. I’m thinking it will store popcorn as my boys have totally been on a kick with that. I can’t say how life changing, literally life changing, this project was for me. For someone that cooks and bakes daily I have no idea what I put it off so much. Every time I open the cabinet I smile. 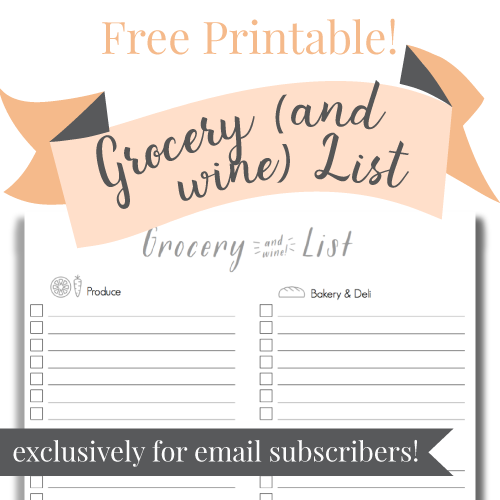 It’s so wonderful to be able to find things quickly and not to mention, you can see what you are running out of so you can add it to your grocery list for the week. 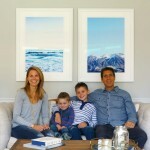 I hope you’ve found this inspiring, maybe you’ll tackle a project of your own? I’d love to see your own organizing work – you can always send me photos and questions on Instagram. I love receiving them! 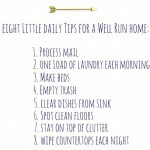 A well run home: eight daily tips. 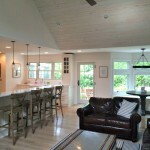 Adding an addition to your home: the good, the bad, and the ugly. I did a recent purge or and organization of my baking cabinet as well. Just without any actual cute storage bins! LOL…I found almond bark from legit 10 years ago….like WHY did I even bother moving that from the other house?! Love this! Yes, it takes time, effort and some planning but look at the result! The crucial thing is to have it organized based on your cooking/baking style (no cookie cutters totally fine). It’s also important to leave room for tweaking down the road— some things won’t work for you as you’d hoped. 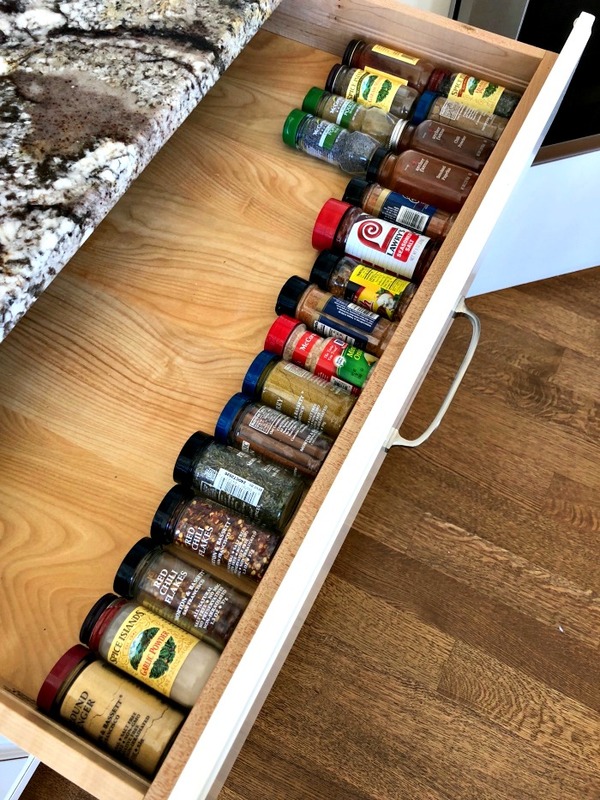 I’ve organized my spices and supplies 4 years ago plus minor tweaks now and then, and it’s mostly stayed the same and made my life SO much easier. Thanks so much! Love hearing how your system has worked for you for four years – that is awesome!